TBT History: Made it to the Super 16 in 2015. Five-time TBT participant. 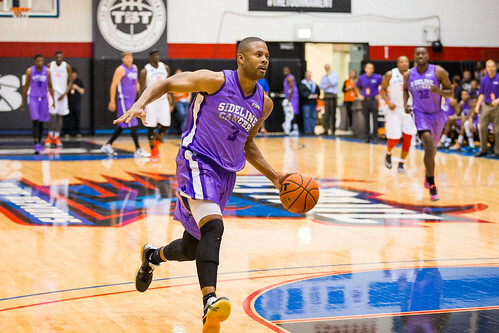 Nutshell: GM Billy Clapper’s squad relies on grit, hustle, defense, and commitment to the fight against pancreatic cancer. It wouldn’t be TBT without Sideline Cancer. GM Billy Clapper and company are just one of four teams (Illinois Hoopville Warriors, Air Force Bomb Squad and Showtime) to compete in all four tournaments. And once again the loveable group of overseas professionals will be playing in part for the Greg & Cathy Griffith Family Foundation, which is dedicated to finding a cure for pancreatic cancer. The team’s best performance came in 2015 when they made a run to the Super 16. 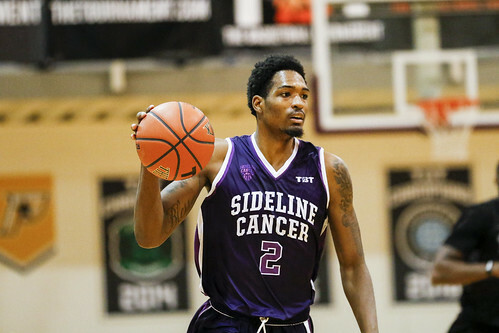 Although they were bounced in the second-round last summer by Team FOE after starting their journey with an upset win over Zoo Crew, Sideline Cancer has a reputation as one of the most gritty, defensive oriented teams in all of TBT. 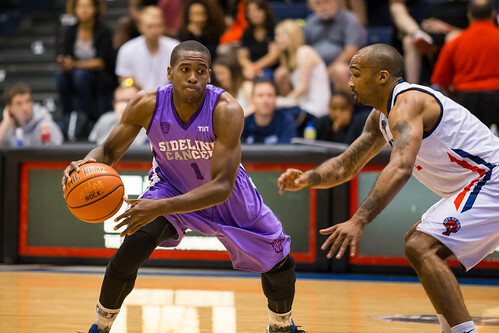 In November, Sideline Cancer faced off against two-time TBT participant DuBois Dream in an exhibition game for charity. The teams raised just under $2,500, which was distributed to organizations dedicated to the fight against cancer including Greg & Cathy Griffith Foundation, Penn Highlands Healthcare Hahne Regional Cancer Center, Caring and Sharing for Kids, and Colors for a Cure. DuBois Dream won the game, 110-100. No matter what happens on the court, Sideline Cancer will be remembered as one of the big winners in TBT 2018. 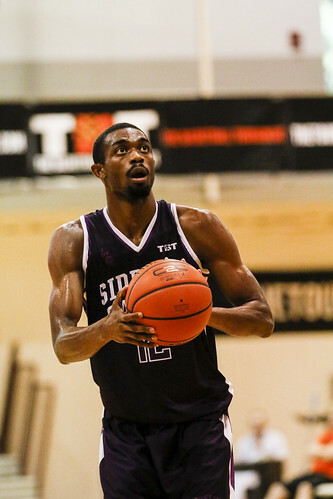 For the second straight day, Team FOE found themselves coming from behind to stay alive in TBT2017. Sideline Cancer shot 47.2% from the field (17-36) in the first half compared to just 37.8% (14-37) for Team FOE – but that only turned into a 40-38 lead for Sideline Cancer at halftime. The shooting momentum switched sides in the second half, as Team FOE shot 55.2% from the field and Sideline Cancer went cold, shooting just 36.7%. 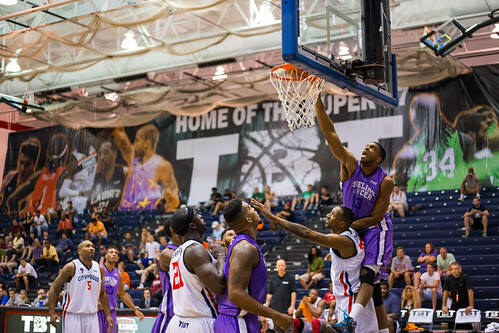 FOE took the lead and didn’t look back – clinching a spot in the Super 16 with a 82-75 win. It was a true team effort for FOE, with five players scoring in double figures. Vincent Simpson led the way with 15 points, Mario Little was right behind him with 14, Tyshawn Taylor dropped 13, Sean Evans added a dozen and Scott Rodgers chipped in 10. Aaron Brown was the high man for Sideline Cancer, putting up 21 points on 8-13 shooting. 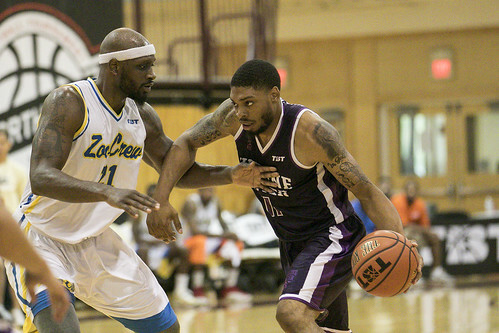 FOE will be back in action on July 20 as they take on the top-seeded FCM Untouchables in Brooklyn. Sideline Cancer defeated Zoo Crew, 100-87 to advance to the Round of 32. Duane Johnson and Aaron Brown both scored 25 points for the victors. Johnson also grabbed 12 rebounds for the double-double. Levance Fields carried the Zoo Crew attack, posting 35 points on 11-18 field goals. Jerrell Wright added 18 points while Jesse Morgan had 17 points. Sideline Cancer outscored Zoo Crew by 17 points in the second half. Led by Brad Wanamaker's 17 points and seven rebounds, The Untouchables knocked out Sideline Cancer, 106-94 on Saturday in the Northeast regional. Comprised of Pittsburgh alumni, The Untouchables raced out to an early lead and finished the first half with a 56.8 percentage shooting from the floor––and a 21-point lead. Jermaine Dixon scored six points and dished out 10 assists. 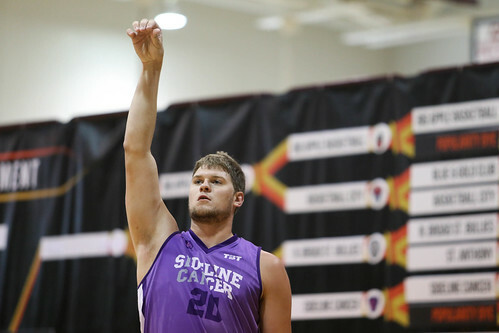 Sideline Cancer's Jarryd Cole scored a game-high 23 points on 10-of-13 shooting. 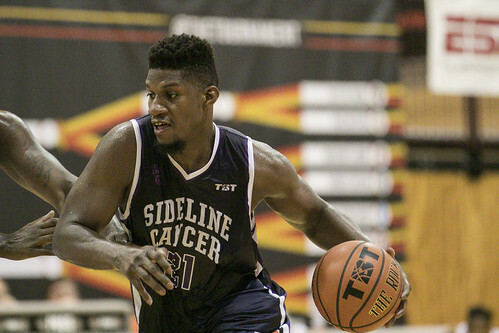 Devon Saddler added 19 points and six rebounds for Sideline Cancer. Loaded with as much elite talent as any other team in The Basketball Tournament, Team City of Gods relies on the play of the team play over that of the individual. In a Super 17 matchup with Sideline Cancer, team play was once again at the core for one of the most dominant teams in this year’s tournament, as all 10 players scored and Team City of Gods downed Sideline Cancer, 91-78. The 13-point gap marked Team City of Gods’ closest margin of victory in this year’s tournament. DerMarr Johnson had 23 points on 7-for-10 shooting, and Team City of Gods shot 68% from the field en route to the win. Omar Strong contributed 14 points, and Mensah-Bonsu added a double-double (13 points, 10 rebounds) for the victors. 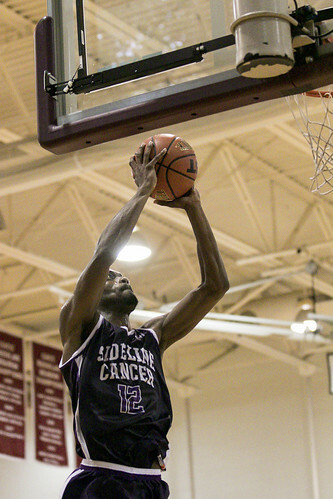 Charles Parker had 19 points in the losing effort for Sideline Cancer, which for the second straight year was playing in an attempt to raise money for the Greg and Cathy Griffith Family Foundation, a non-profit devoted to helping defeat pancreatic cancer. Despite the setback, Sideline Cancer isn’t done yet. 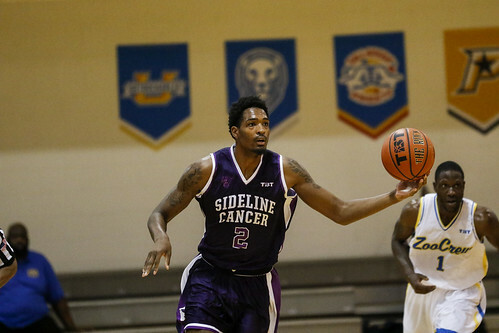 Jarryd Cole (16 points, 10 rebounds) and Duane Johnson (11 points, 10 rebounds) each registered a double-double, and Sideline Cancer held off a furious rally from Big Apple Basketball to win, 70-67. Andy Robinson had 11 points for Sideline Cancer, which led by 22 points at one point before holding on for the win. Derrick Caracter’s 17 points led the way in the loss for Big Apple Basketball. 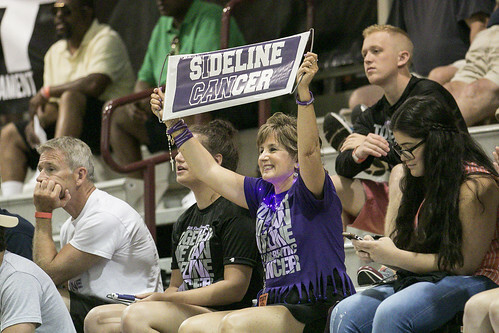 Sideline Cancer will now face Team City of Gods in the Super 17 in Chicago. 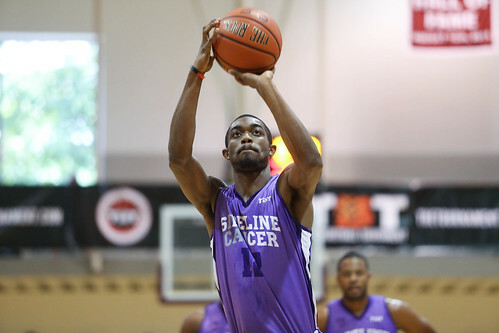 Charles Parker scored 17 points in 21 minutes to lead Sideline Cancer past the North Broad Street Bullies, 72-63. Andy Robinson and Tre Bowman had 16 points apiece for the victors, who had nine different players score. 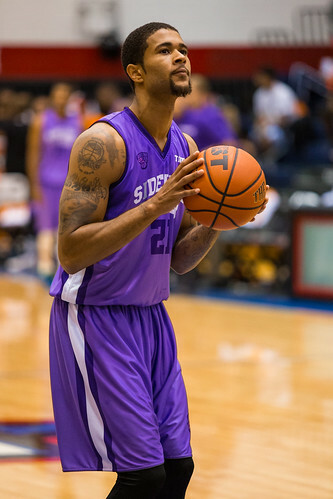 Ramone Moore’s game-high 20 points paced the offense in the losing effort for the North Broad Street Bullies. 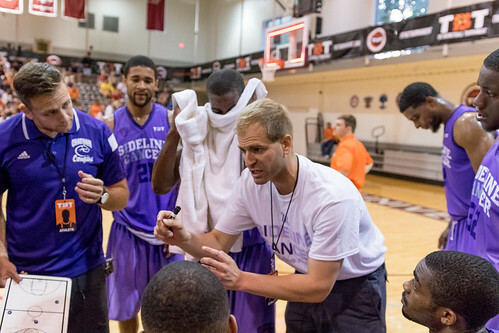 Every member who has worn the purple for #SidelineCancer made the decision to play for something bigger! Former @UBmenshoops standout Jawan Alston played for our team in 2014! A flashback with this basketball card of him!